Worker Who Sent Hawaii False Alert Thought Missile Attack Was Imminent : The Two-Way A drill during a shift change included the words "This is not a drill," a Federal Communications Commission report finds. According to reports, the worker has been fired and two officials have quit. The FCC said Tuesday that the false alert of a ballistic missile sent in Hawaii on Jan. 13 occurred when the worker in charge of alerts confused a drill for a real missile emergency. A highway sign in Honolulu corrects the error. The report finds that the false alert was not the result of a worker choosing the wrong alert by accident from a drop-down menu, but rather because the worker misunderstood a drill as a true emergency. The drill incorrectly included the language "This is not a drill." The top two civilian officials at Hawaii Emergency Management Agency announced their resignations Wednesday, Reuters reports, and the employee who issued the alert was fired. In addition, the agency's military director told the wire service, a midlevel manager is being suspended. The Associated Press reports that the fired employee had "confused real-life events and drills in the past, the state said in a report. His poor performance has been documented for years, and other members of the team say they were not comfortable working with him in any role." The AP says the state's internal investigation found that the employee was told to cancel the alert, but he "just sat there and didn't respond." Another employee eventually made the correction, as the worker "seemed confused." At 8:05 a.m., the agency's midnight shift supervisor began a no-notice ballistic missile defense drill during a shift change by placing a call to the day shift warning officers, in which the shift supervisor pretended to be U.S. Pacific Command. The supervisor specifically decided to run a drill during a shift change to train officers for a challenging situation. The midnight shift supervisor played a recording over the phone that includes the correct drill language "EXERCISE, EXERCISE, EXERCISE" — but also erroneously contained the text of an Emergency Alert System message for a live ballistic missile alert, including the language "THIS IS NOT A DRILL." The recording ended by saying "EXERCISE, EXERCISE, EXERCISE." The day shift warning officers received this recorded message on speakerphone. While other warning officers understood that this was a drill, the warning officer at the alert origination terminal said he believed that this was a real emergency. In a written statement, the officer said he had heard "this is not a drill" but not "exercise, exercise, exercise." At 8:07 a.m., the day shift warning officer responded, as trained for a real event, by transmitting a live incoming ballistic missile alert to the state of Hawaii. In doing so, the officer selected the template for a live alert from a drop-down menu and clicked "yes" in response to a prompt that reads: "Are you sure that you want to send this Alert?" The day shift warning officer received the alert on a mobile device a minute later. That alert, sent to mobile phones and blared across television stations in the state, said: "BALLISTIC MISSILE THREAT INBOUND TO HAWAII. SEEK IMMEDIATE SHELTER. THIS IS NOT A DRILL." At 8:09 a.m., the agency alerted Hawaii Gov. David Ige that the false alert had been sent. 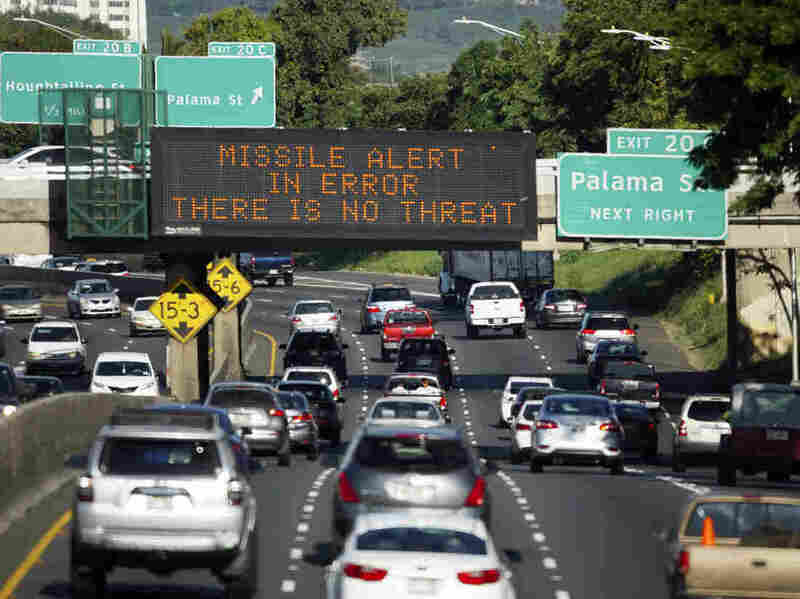 It took until 8:20 a.m. for the agency to post to its Twitter and Facebook accounts that there was no missile threat to Hawaii. The governor didn't retweet that notice of no threat until 8:24 a.m. — a delay Ige attributed to not knowing his Twitter password. And it took even longer to issue a correction through the emergency alert system: That correction wasn't sent until 8:45, a full 38 minutes after it had sent the false alert. In remarks at the FCC's open meeting on Tuesday about the false alert, FCC attorney adviser James Wiley said the worker who transmitted the alert has refused to speak with the commission. But Wiley said that the Hawaii Emergency Management Agency gave the commission information from a written statement by the worker made shortly after the incident, which has helped the FCC in its investigation of what went wrong. "Because we've not been able to interview the day shift warning officer who transmitted the false alert," said Wiley, "we're not in a position to fully evaluate the credibility of their assertion that they believed there was an actual missile threat and intentionally sent the live alert (as opposed to believing that it was a drill and accidentally sending out the live alert). But it is worth noting that they accurately recalled after the event that the announcement did say 'This is not a drill.' "
The FCC public safety bureau attributed the false alert to a combination of human error and inadequate safeguards: There was no procedure in place to prevent a single person from mistakenly sending a missile alert to the state of Hawaii nor was there a procedure for recalling a false alert. Since the debacle, the state emergency agency has implemented new safeguards. Two credentialed warning officers must validate every alert and test. Supervisors must receive advance notice of all drills. It has created a template for correcting false alerts. And the agency has stopped running ballistic missile defense drills entirely, until its own investigation is complete.